1984 gave us some cool stuff – the world’s first Macintosh computer, the first untethered space walk and, course, UK “Supergroup” Band Aid was formed. Robots seemed to be the order of the year for the holiday season – there were high-end offerings, low-end offerings, things for kids and grown-ups alike. Society seemed ready to aggressively welcome robot butlers in our lives, regardless of whether the technology of the day was up to the task. I admire our optimism; despite raging famine, volatile political landscapes, and a recession in the US, there was still a bright beam of hope for the future. I’ve rounded up some notable draws of the holiday season but first let’s take a look at how awful the grown-ups had it in the realm of gifts. Decidedly not-a-robot, Barbie went in an odd direction this year as she donned an obscenely frilly ball dress in her “Peaches and Cream” variant. Such a strange dress. Plant that fashion flag, Barbie! Kind of a robot? Apple took a stab at a portable computer in 1984 with the IIc. It didn’t shake out to be nearly as popular as the IIe and was somewhat trounced by the competition, but it had a moment that holiday. Not crazy about the dad-shaming in this ad! Now we’re talking! Tomy’s Omnibot line was the robot servant dream come true for kids. Sort of. This guy had a tape recorder that you could record commands with or just use conventionally. It had a claw that could pick up light objects. It had a clock! This ad also suggests that Omnibot is attracted to vacuum cleaners and also makes you want to breakdance. TOMY had an extensive Omnibot family. There’s a lot here; I’ll probably revisit this soon. For those with slimmer budgets and the desire to get playset-action-figurey with their robots, the Maxx Steele and Robo Force line was more appropriate. 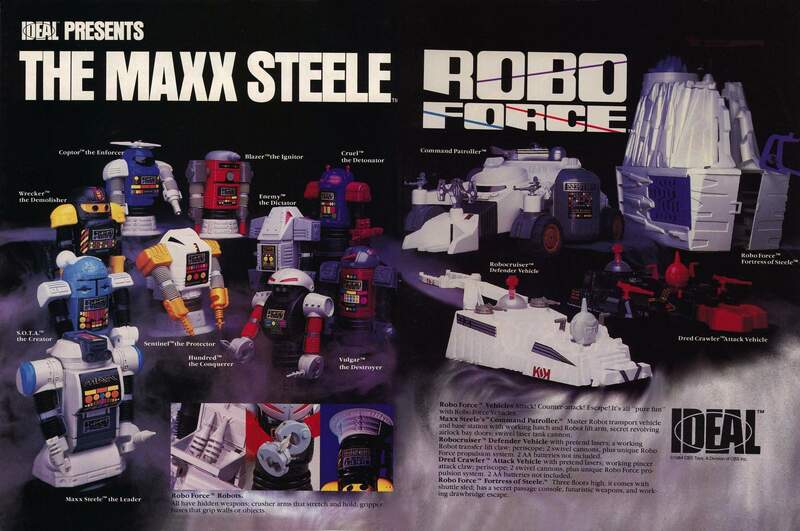 There were more expensive Maxx Steele robots on the market as well, but they were pretty prohibitively priced. The Robo Force line is impressively deep. And finally, the main course. Transformers were the Cabbage Patch Kids of 1984, the toy that everyone wanted but nobody could find. I’ll never get sick of news reporters trying to describe what makes toys so fun. Fad and Scarcity aside, these toys were great. Well made with a diverse range of features and a clear ‘script’ on how to play with them if you wanted that sort of thing. Soundwave was a “tape robot” that you could carry around with you. Sorry, Omnibot, that’s one point for Soundwave! This Wal-Mart ad focuses strictly on the Autobots, which is a really weird choice to make! And that’s 1984! Did I miss any must-haves from your list? Let me know!